Watch Escapist Video on iDevices with Publishers Club and Help Charity! Join the Publishers Club, watch Zero Punctuation and other video content on your iPad for a year, and help charity while you're at it. The Escapist Publisher's Club is the best way to receive all of your favorite editorial and video content on our site. The awesome part is that once you sign up for the Pub Club, you are a member for a whole year and you get to enjoy a whole bunch perks available only to you. The Publisher's Club only costs $20, and in keeping with the spirit of giving this holiday season, up until December 31, 2010, we will be donating 50 percent of every subscription to the Child's Play charity. Child's Play provides game consoles and titles to children's hospitals around the world. That's not the only way that we're celebrating the holiday spirit; you can also now send a Publisher's Club subscription to a friend. What better way is there to spread some holiday cheer by donating games and consoles to kids than treating yourself or your friends to a subscription to some of the best videogame content on the web? Watch all of our video content in the highest quality available, including newly posted material and all of our archived content. Not only that, but you can now watch video with an HTML 5 video player that is compatible with the iPhone, iPad and other iDevices. All advertisements (including videos) are turned off and the ad banners are all replaced with random comics from Shamus Young and mottoes from other Pub Club members. 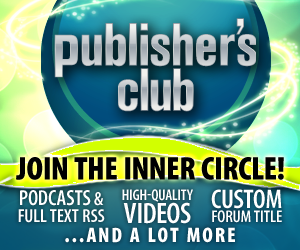 Exclusive forums for Publisher's Club members. Bonus content like behind-the-scenes videos and outtakes. An RSS feed with all of our content including video podcasts. A bunch of discounts and sales for all of your nerd supply needs like fantasy swords and weapons, RPG books and gaming gear. Sneak peak at new shows. Custom title displayed above your avatar for when you post on the forums. It's hard to believe that you can enjoy all of these perks for a whole year by only forking over $20. Again, until the end of the year, half of each subscription will go to Child's Play, so there's no reason not to head over to this page and sign up for The Escapist Publisher's Club today! And if that wasn't enough, perhaps a dancing imp can convince you?